A beautiful smile is one that’s healthy, bright and symmetrical. While not all of us are naturally gifted with such characteristics, the hands of an artistic cosmetic dentist can change that with the help of custom dental veneers. Veneers are an excellent and popular aesthetic procedure because of how significantly they can transform your appearance. A dental veneer masks the tooth behind it, working alongside of other veneers to instantly make your smile look whiter, properly shaped and aligned, without braces or other treatments. Emax veneers offer superior results compared to traditional porcelain options. The stronger material makes your teeth more resistant to everyday wear without compromising aesthetics. Each Emax veneer is compromised of micro-thin layers of ceramic, increasing the overall durability of the restoration. Being that the final results are thinner than a conventional veneer, less alteration to your tooth is needed. Like any smile makeover, planning for dental veneers requires a few different steps. At your initial consultation we will discuss what aspects of your smile you would like to change, then suggest a plan and design for your new veneers. You can even select which colour they will be. 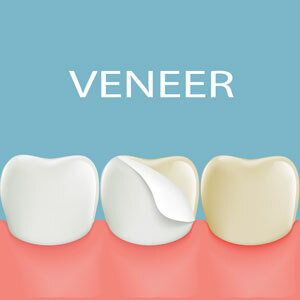 A thin layer of enamel will need to be buffed away before veneers can be bonded to the front of your teeth. Depending on how sensitive you are, we may use local anaesthetic to keep you comfortable. An impression is made of your prepped teeth, which is sent to our lab where the Emax veneers are crafted by hand. About two weeks later, your temporary veneers will be removed so that the permanent ones can be bonded in place. Are veneers right for you? Book a consultation online to find out.